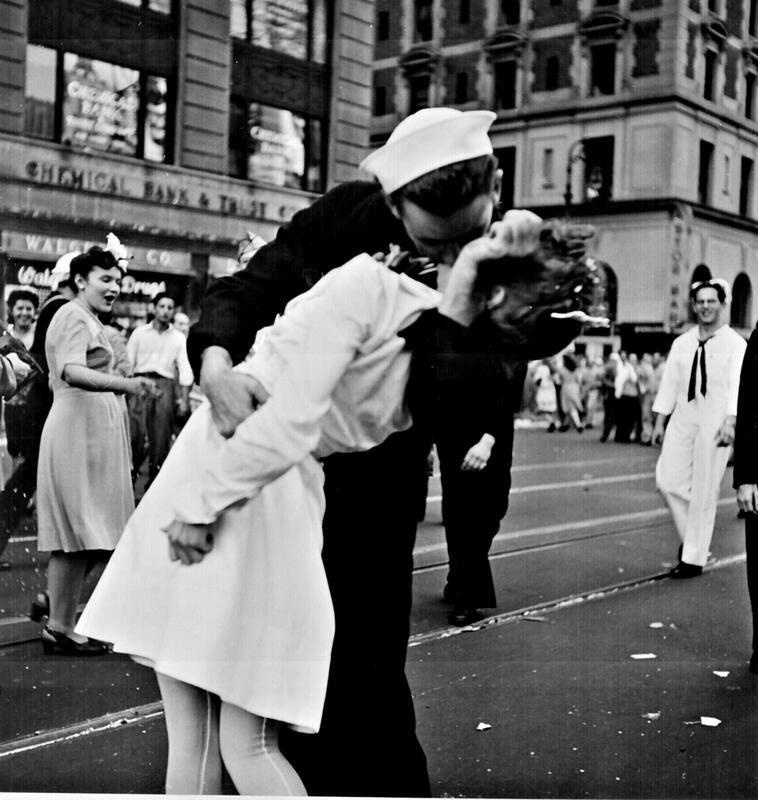 Seven decades ago, Petty Officer 1st Class George Mendonsa and his date were among the hordes in Times Square celebrating Japan’s surrender and the end of World War II when Mendonsa grabbed what he thought was a nurse (she was a dental assistant), leaned her back and kissed her in a fit of emotion. Life magazine photographer Alfred Eisenstaedt captured the moment, and as they say, the rest is history. The iconic photo came to represent the relief and excitement over the war’s end, but Eisenstaedt never got his subjects’ names. On the photo’s 40th anniversary, Life asked the nurse and the sailor to come forward, fielding hundreds of submissions. But it wasn’t until 2005 — 60 years after the fact — that a Yale photography expert was able to analyze the photos and identify the two as now 92-year-old Mendonsa, of Rhode Island, and Greta Zimmer Friedman, a 91-year-old Maryland native. The key was a woman looking on in the background, the only notable person whose faced wasn’t obscured: Mendonsa’s future wife, Rita. To mark the photo’s 70th anniversary, couples gathered in Times Square on Friday to reenact it. The men donned Dixie cups and the women, presumably, were willing participants. The blogger characterized the kiss as a sexual assault, because Mendonsa was clearly a stranger and didn’t ask for permission. She said that in most other contexts, a man grabbing a woman and kissing her on the street would be an assault, but it had been glorified because of what it represented to so many people. Friedman, however, clarified that she didn’t feel assaulted.